He emphasizes the same concepts he practices: dental health diagnosis, treatment plans for medically compromised patients, conservative treatment, cosmetic dentistry, and customized approaches to periodontal care, implants and laser dentistry. Dr. Graham is the founder of the Catapult Group, a continuing education company whose philosophy and programs use contemporary, interactive formats to ntegrate time-proven conservative dentistry with 21st century materials and techniques. Dr. Graham is a published author in many leading national and international dental journals. He is a member of the American Dental Association, American Academy of Cosmetic Dentistry, Academy of General Dentistry, Chicago Dental Society and Illinois Dental Association. Dr. Graham is a graduate of Emory Dental School. He is the former Dental Director of the University of Chicago’s Department of Dentistry. He enjoys providing dental care at his multi-specialty private practice group, University Dental Professionals, in Chicago, IL – Hyde Park. Lou Graham, DDS is an accomplished speaker available to speak at your event for half-day, full-day and multi-day lectures, custom courses, and hands-on workshops. In dentistry, superior diagnostics relates to creating more efficient methodologies to result in better decision making and ultimately a higher quality of care and long-term success. 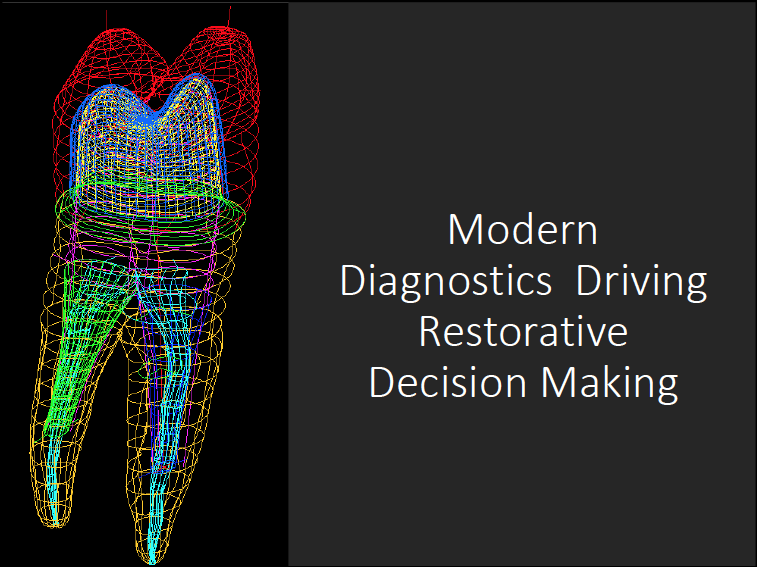 Ultimately these diagnostics can actually lower the costs to the patient by creating far more customized approaches to their dental care and equally create the ideal treatment plans for long term success. This course will take the attendee into modern day general dentistry and demonstrate why the GP must be in control in how they integrate treatments with their specialists. Throughout the day, the business of dentistry will be presented, integrating the latest in software technologies and “actionable analytics” to demonstrate clear pathways in creating office/hygiene growth. This is a great team course and is designed with common sense approaches to drive your office forward. Today’s initial exam and why CBCT imaging will be replacing the FMX, and it will! Truly Personalizing your communications, why it is not an option! Success is a very interesting word as it relates to a dental procedure. What is a successful restoration? Is it one that lasts 5 years, or 10 or 15 or 20 plus? Or, did it prolong the life of the tooth until another replacement restoration was required? What is success? This course is all about expanding your game as a general dentist, and covers topics that are essential to understand and equally, deliver to our patients. Treating Cracked Teeth: Trying to make sense of it! What does the literature really say? For over 100 years, the standard of care for caries diagnostics has been the explorer and x-rays. Let’s all agree that if you are utilizing these as your solo tools for caries diagnostics, you are simply guessing way too much when to pick up the drill and equally, you are so limiting your patients on what truly you could offer them, both in prevention and early minimally invasive treatment. The am program will challenge you with new protocols for care, problem solve many of the issues today in direct restorative dentistry. The program then transitions into far more challenging casework that will include both direct and indirect restorative clinical care. This full day program will update the attendee with the latest in adhesion dentistry along with many of the latest techniques and materials available today. Modern Day Diagnostics: Is it time to put down your explorer and truly compliment your digital x-rays with the latest in caries diagnostics and offer new protocols to your patients? Yes, it’s time. The key pitfalls in direct adhesion and how to avoid them, you will be surprised! Digital Crown and Bridge: Oh the joy of impressions and more! The foundation of this course is based upon: Practice Growth is equated directly to Hygiene Growth. With such, the hygiene appointment has to be far more than “just a cleaning” and gone are the days of diagnostics with just a probe, an explorer and 2D x- rays! “Value” equates to customized treatment plans, in office dental plans and so much more. Adding data analytics and other essential technologies all streamline the office into 2018 and beyond. This course is recommended for the entire team. Doctors, bring your team or should I say, teams…bring your doctors! Why the outlook on dentistry has changed and your office must be ready for these changes and this means efficiency both clinically and business savvy. You’re running a business, do you know your Key Performance Numbers that can predict growth or the opposite, a practice in decline. This will fascinate you as too what “we need to know” and equally, what to do with this information! Understanding the “WHEEL” which will define consistency and communication between the doctor, hygienist, and patient. The value of Oxygenation, a game changer in our approach to refractory periodontal patients and so much more! Instant growth for your practice and a MUST HAVE. With patients entering their 8th and 9th decades of life and even more, our role as health care providers continues to face new challenges in treating this population. As these patients walk into our offices, they present challenges that are often unique and require customized approaches to their care. Prevention is for all ages and doesn’t stop here! "Excellent, good audience participation. Very happy I attended"
"Excellent, good audience participation. Very happy I atten I appreciate all of the restorative materials and techniques I never would have known about. Dr. Graham welcomed all of our questions and gave great answers." "I thoroughly enjoyed the course and wished I could attend the course he was teaching the next day on direct restorative. " "I wish I had signed up for his class on Saturday too.."
"One of the best lecturers I have heard in a long time! " "This was one of the most exciting speakers I have heard in 35 years." "Very informative! We learned much today. Thorough, relaxed, so prepared. This dentist is an educator!" " Lou, a great presentation. I was only coming for an hour. I had intentions of joining my family for the rest of the day. Instead, I stayed in your course for the day!! Your information was very timely." "Excellent program. I understand why his office is so busy! Dr. Graham was extremely knowledgeable about all aspects of dentistry. I would recommend this Dr. to everyone. I wish he was my dentist. Every dentist could learn a lot from him." "I wanted to thank you for being such an inspiration. I came to the seminar not really knowing what to expect and left with a clear vision of the type of dentist I aspire to be and the type of practice I wish to have. I am so thankful to have had the opportunity to listen to you speak." "His approach to geriatric dental treatments is quite spot on and very practical. He has different points of view and I picked up some of good, useful tidbits that I can apply to my practice." "Dr. Graham, Thank you for an amazing course at the ADA. I was at your friday afternoon session for Indirect. I really wished I could have made it to your other course but I only came up for the day. I have been practicing 14 yrs. plus and I have taken hundreds of hours of CE but in the end I have always been left thinking "well I didn't get that much out of that". I thoroughly enjoyed your course and took away a lot of pearls. I hope to take another course with you in the future. Your speaking style is very engaging and you're not putting down your audience for a "stupid" question. I'm often intimidated to ask questions during the course but you made it easy to do that. Have a great day!"